The first ever Push Truck Dual UMP Late Model Features at Oakshade Raceway treated the fans to some spectacular racing action on Saturday evening with Matt Miller and Casey Noonan each picking up a $1500 feature victory. Matt Miller, the 1991 Oakshade Raceway Late Model Track Champion, started on the pole for the first 25 lap feature and immediately took the lead over Dan Wallace. Wallace maintained second until lap 21 when Noonan took over that position. The first of the push truck sponsored dual feature events went entirely caution free with Matt Miller taking the checkered flag over Noonan and Wallace. Rusty Schlenk finished fourth and Ronnie Perrine Jr. was fifth. The second UMP Late Model Feature started 23 cars with John Gamber, George Lindsey and Cody Houston added to the line up. Gamber was highest in points not to race in to the feature and Lindsey and Houston were the next highest finishers in the consolation race. The top six finishers from the first feature were inverted for the start of the second and unlike the first feature, the second feature was marred by many caution periods. Rusty Schlenk took command at the start. It didn’t take long for Matt Miller to start knocking on the door for the lead as he worked his way up to second behind Schlenk. One of the numerous cautions came out after Ronnie Perrine Jr. fell off the pace on the front stretch while running in the top five. This caused a melee behind him as the field stacked up. Chris Ross, Chris Keller and Mike Miller were among some of the cars involved. Just after the restart, Matt Miller looked to the outside of Schlenk going into to turn one. Miller got up too high and spun around and brought out another caution. Miller had to drop to the tail with 22 laps remaining to try to work his way back into contention and that is exactly what he did. Schlenk had opened up a lead over Casey Noonan who was running second until Noonan took advantage of a restart after a caution to get to the inside of Schlenk and take over the lead. Noonan then began to stretch his advantage in the closing laps. Miller worked all the way back up to third and got into the rear of Mike Harger a lapped car, on lap 22 that sent Harger spinning to bring out the final caution of the race. Miller restarted in third right on the tail of second place Schlenk. Miller and Schlenk battled hard for second the final few laps allowing Noonan to go on and pick up another UMP Late Model Feature win after winning the ALMS Feature last week at Oakshade Raceway. Matt Miller came up one position short of passing the entire field and had to settle for second followed by Schlenk, Curtis Roberts and Curtis Deisenroth. Joe Derbeck snatched the early lead of the UMP Sportsman Feature after starting on the pole, but could not hold on to it as Brice Luttrell muscled by on the inside to take over on lap two. Jeff Grochowski spun in turn four to bring out one of the caution flags in the race. Matt Lindsey restarted fourth after the caution and jumped to the outside and began picking off positions, taking the lead on lap eight. Lindsey went on to capture his first feature win of the year with Derbeck getting back around Brice Luttrell to finish second. Amy Bernard finished fourth and defending Oakshade Raceway UMP Sportsman Track Champion Mike Jessen ended up fifth. Curt Lancaster started on the outside of the front row of the UMP Bomber A Main and grabbed the lead early with Jerry Signor pressuring him in second. Signor won the previous two week’s A Mains. Lancaster was able to pull away from Signor on his way to pick up his first feature win of the year. Signor held on to finish second followed by Danny Hogrefe in third after starting 11th. Rick Dixon was fourth and Dustin Sautter came home fifth. Dylan Herman looked to be headed to his third UMP Hornet Feature win until slipping up high in turn two with a flat tire while leading. Adam Noonan, also looking for his third feature win slipped underneath Herman’s ailing car to take over the lead and didn’t look back. The sixteen-year-old driver held on to pick up the victory. Derek Morris finished second followed by Gabe Mueller and Drew Smith who finally broke his string of second place finishes, ending up fourth. Nate Meinka posted a fifth place finish. Terry Rushlow and Jim Guinn had a heated lead battle for much of the UMP Bomber B Main that was slowed multiple times by cautions. The two drivers kept trading the lead back and forth. A late caution set up a two-lap shootout to the finish. With Guinn leading, Rushlow and Karl Spoores got hooked together in turns one and two on the final lap, knocking both drivers out of the top five and allowing Guinn to pick up his first feature win of the year. Jack Waldfogel survived to finish second followed by Rick Dippman, Bob Krumm and Kevin Cole. The UMP Bomber C Main started off with a three wide battle for the lead between Bob Mayer, Chuck Faller and Ron Bloomfield Jr. Bob Mayer eventually came out on top of that deal, but would suffer some bad luck on lap six that would cost him the lead. Mayer got loose in turn four and had to let off the gas and gather it back up. Meanwhile, Chuck Faller and a host of others took advantage, moving by Mayer who fell back to fifth. In the end, it was Temperance Michigan’s, Chuck Faller who ended up victorious with Cody Walls finishing second. Ron Bloomfield Jr. slipped back to finish third. Josh Overmyer moved up to finish fourth after starting 10th. Bob Mayer held on to finish fifth. 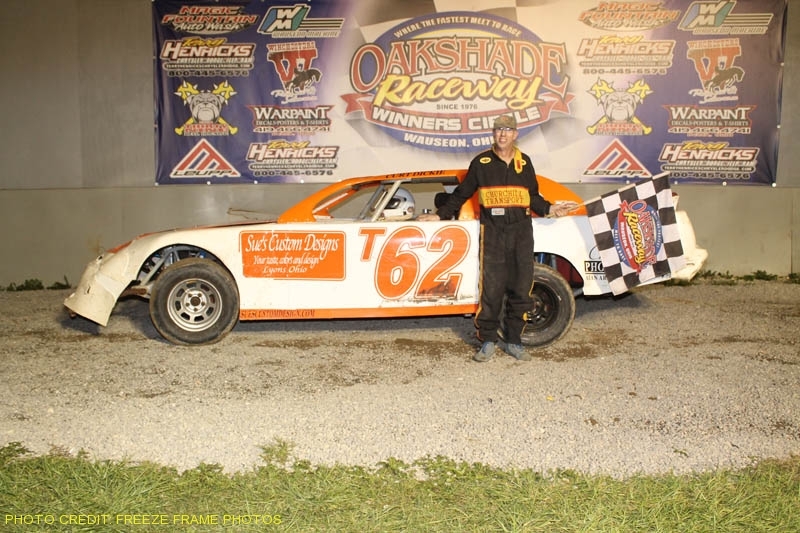 Oakshade Raceway will host Wallace Racing Products Night on Saturday, June 6 that will feature a full racing program of UMP Late Models, UMP Sportsmen, UMP Bombers and UMP Hornets. Gates open at 4pm with racing at 7pm.